After conveying my greetings, I comply with the pleasant duty of presenting to you the following request in relation to Dr. Alejandro Pena-Esclusa, currently detained in SEBIN. As you may know, Dr. Pena-Esclusa has been in prison since July 12, 2010, charged with “concealment of a weapon of war” and “conspiracy.” In spite of this considerable time lapse, his trial has not been scheduled yet. I have known Dr. Pena-Esclusa for many years now and have always enjoyed an appreciation for him. 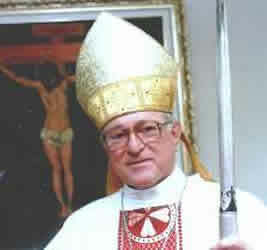 We are related through our common link to the Catholic Church, a faithful practitioner he is. He has been married 22 years with Indira. Both lead an exemplary family life. They have three daughters who are their greatest joy. He is an engineering graduate, involved in politics as a lecturer and writer. He has publicly expressed his thoughts, as well as his firm democratic stance, in opposition to the Venezuelan government. He advocates principles and criteria of nonviolent resistance, which reminds us of Gandhi and Luther King. He decided to face his own imprisonment with strength and profound conviction, knowing in advance that he would be detained. 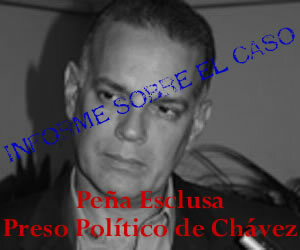 He is confident of his innocence against any allegation of provoking a government change trough unconstitutional means. I will not go here into political or legal considerations about the grounds of this accusation. My intention is solely to appeal on humanitarian grounds, so that he may be free on parole or on house arrest to await trial, given that Dr. Pena Esclusa is suffering from prostate cancer, a severe recurring disease that requires medical treatment to prevent metastasis, and also needs being in a healthy, quiet and familiar surroundings. As I mentioned, he has been imprisoned for ten months without medical treatment, which has increased the risk of metastasis. I formalize this request as a citizen and as pastor of the Church, with experience in humanitarian intervention in cases of detainees, particularly in the one made in favor of the current President, acknowledged by him, after he was taken prisoner in 1992. With our hopes in God, who is just and good, so that this request will be received, and move you to consider other initiatives of similar cases, as well.